Here's my last block for 2012. 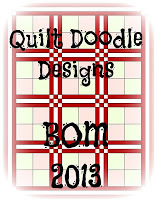 It's the first BOM for Quilt Doodle BOM 2013. It's called Monkey Wrench. You can find all the info here. Happy New Year everybody! I'm looking forward to makeing 2013 a great year. Family & Self Portrait QA? I joined a facebook group with Shruti Pandit Dandekar from Satara, India. I love to learn new things. Shruti is going to help us make a self-portrait quilt. I know it sounds a little silly, but I have a feeling that mine will be a little abstract anyways. I found Shruti in the Modern Quilt group on facebook. I'm leaning towards using the photo of just me in my red shirt. I took that photo when my husband was working out of town in Maine for over a month. It's actually taken with my phone. He and I would send pics and texts back and forth. 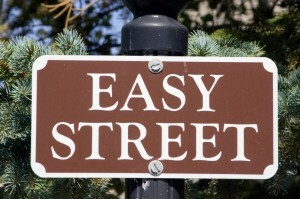 Step six of Bonnie Hunter's Easy Street is complete. This was another easy step for me. I did not use a lot of variety in my blocks. I only used four different fabrics, two of which were vintage sheets. I still don't have a clue how this mystery will end. Right now it's still just a box of 3.5" squares. Maybe we'll be using them to make 9-patches or 16-patches? That's all I have for a guess. Step 6 was to make 128 bricks using 2" strips. These are 3.5" square. What's one more block per month? Head on over to Quilt Doodle Doodles by Quilt Doodle Designs. Cindy is having a BOM that will release the 1st of every month. It's kinda a mystery too. Her fabrics are beautiful. Can't wait to see what I pull from the scraps. There's a Flickr group too. Hmmmm. Although I am starting to really like modern quilts I may have to just be a watcher on this one. I have a lot of projects going on at the moment. I needed to make a birdhouse block for my LQG. The theme for our Spring Tea is Birdhouses and Birds. I came across this tutorial by Julie from Intrepid Thread on Pinterest. It uses the GO! Baby and the Drunkard's Path die. Perfect! Here's my block using the blue fabric for the sky, the bird (which looks a little small for this birdhouse, but maybe he's just visiting...) and the post material from my LQG. Another easy step for Easy Street. Part 5 only needed 64 blocks to be complete. Are they the little houses on Easy Street? Will Bonnie Hunter have us put little squares on the other side to make them a diamond? The mystery continues. With tears in my eyes I wrote a note from our Elf, Chippy. I'm sad to see Chippy go, but I know he must. I wonder how many children from Newton, CT had an Elf on the Shelf. 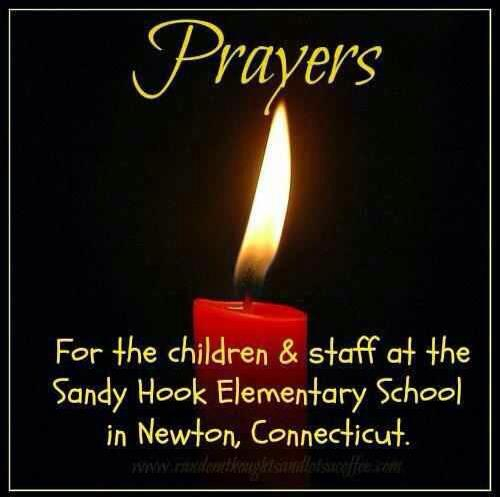 I can't imagine how their parents and families are feeling right now. 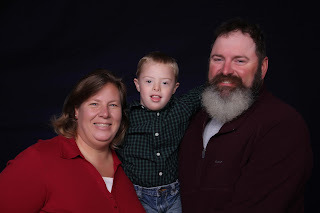 I hug our son tigher each day. I finally made a block to go with the eleven blocks that I won from Fiona back in February of 2012 during the Fugly Fabric giveaways. They look like something made for a swap or bee and only 11 blocks were received. It also could have been a sampler that turned in to a UFO. I just think it was a bee project because the only fabric that is the same is the butterfly fabric (which could have been provided by the originator.) Each block has the same butterfly focus fabric except the one that I made. I found some similar butterfly fabric in my scraps. I think they will all blend together okay. It will be a nice longarm practice sampler quilt. I plan to use a cream tone on tone sashing with blue/metalic paisley that looks a lot like the butterfly fabric as corner stones. I don't know about borders yet. Now off to cutting squares for Easy Street. I still don't know how this mystery is gong to end. Great job, Bonnie Hunter... AGAIN! Here's the block that I received from Shannon from the December Block Swap Adventure. I requested the Churn Dash block, but how did she know that I just LOVED orange? I don't know if the picture shows the detail, but the cream background fabric is gorgeous too. Thanks, Shannon! I love it. I decided to sew all of the blocks together without sashing. I also decided to ditch the pointsettia Christmas fabric for borders. I wasn't sure if I would have enough of it. I am very happy with the green border fabric that I found in my stash. It didn't take much of a dent out of these scraps. Guess I'll have to join in on another scrappy quilt along. Let me know if you see any out there! Here's all of my blocks for the Scrappy Christmas QA with Katrina at Sunshower Quilts. Is it too busy? I plan on giving this quilt a nice poinsettias border. I am thinking about a green small inner border first. Will the border be enough place for the eyes to rest? Right now I am leaning towards just sewing it as is without sashing but adding the two borders. Suggestions -- please! It seems to look much calmer in the photo than it does in real life. I thought I was going to be able to post my blocks for the Scrappy Christmas Quilt Along, BUT after fininishing my blocks this morning (so I thought) I am three blocks short! The pieces of the three blocks were in another storage container. Luckily they are all together and I just have to put the 16-patch blocks together. Hopefully tomorrow I'll have something exciting. I totally forgot to sew the flying geese units together in Step 4 of Bonnie Hunter's mystery quilt, Easy Street. Now I'm all caught up, thanks to Ann Marie at 16 Muddy Feet. This is just one of the reasons why I just love quiltalongs and mystery quilts! Not only do they keep me on track, others are quilting along. Keeping right up with the pack, Step 4 of Easy Street is complete. As promissed, Bonnie has made this mystery quilt easier than the last. Here's 64 flying geese that measure 2" high x 3.5" wide. The colors are much better than this picture. I even had time to cut the 145 greens that are 3.5"! I'm hoping that they stay in the square shape and that we don't have to make half square triangles out of them (since they end in .5 instead of 7/8") I think they are going to be attached to the flying geese somehow. I can't imagine waking up today and not being able to hug my child. Here's the last four blocks for the December Block Lotto for a total of nine blocks. Now that these are done I will move on to Easy Street with Bonnie Hunter! 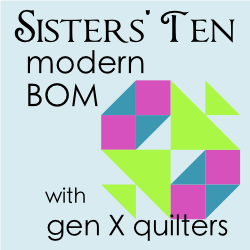 For 2013, the Modern BOM with gen X quilters is pretty tempting. It's only one more block a month. Now on to Easy Street flying geese... Another easy clue! Yeah. Here's the three blocks that I got done today for the Block Lotto. This block is called Star-Crossed. I'm going to try to finish my other four blocks for the month for the nine totoal blocks for the Block Lotto before moving on to Bonnie Hunter's Easy Street. I like this look and want to make sure I get all nine chances to win. Here's my second block for the December Block Lotto. It was supposed to be a black star with the orange as the background fabric, but I must have fell asleep at the wheel and made the blocks backwards. The light strips in the center are different than the other. This is the end of these fabrics (black and orange). I plan on making enough blocks (nine). Most likely the blocks will be mailed to different winners. I'll definitely be more careful when making other blocks. Here's my first block for the December Block Lotto. It's called Star-Crossed. It's a 9" block that has a light, medium, and dark value. I have yet to figure out how to make my camera do the black and white thing. I'm sure it's on there somewhere. I will play with the camera more tomorrow. Again, another block that I just adore! Oh, and good news on the Block Swap Adventure. A new leader has stepped up for the challenge. Melissa Byerly will be our new administrator. Thanks, Melissa! We will miss Linda dearly. We thank her for starting and organizing each months blocks. This is a quilt of 25 textured blocks. I will do a few per month. I don't have a goal of when this has to be done. I plan to learn some new skills. I have not made any textured blocks as of yet. This looks like an exciting scrap project. Although I didn't complete all twelve quilts for 2012, I am happy with my accomplishments. For December my block swap partner was Shannon from Idaho. Here's a sneak peek of the block that I made for her this month. Sadly this may be the last block for the Block Swap Adventure unless someone takes over the huge roll of organizing it. Linda is moving on to better things. 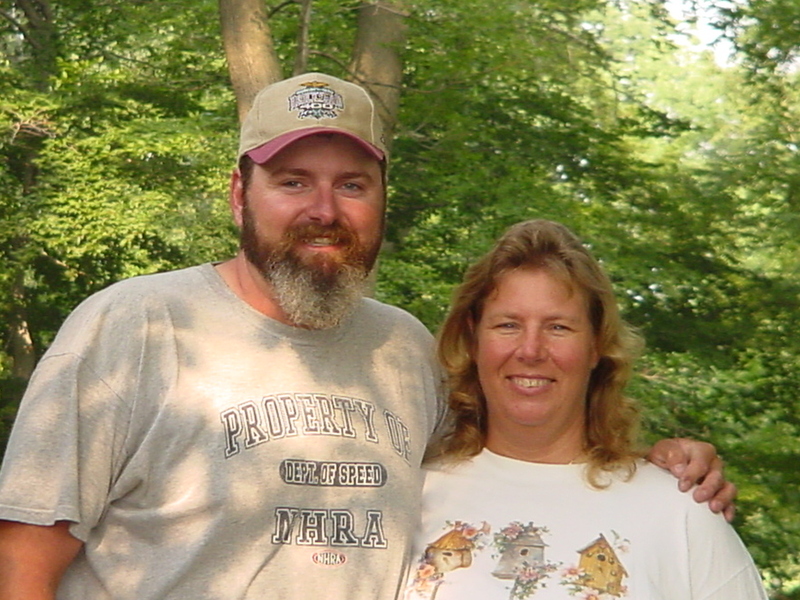 I loved my time there and wish Linda all the best. It was a fun Adventure! Thank you, Linda, for all of your time dedicated to the swap.